The Bethesda Health Emergency Department is ready to care for you whether you are having a heart attack, if you think you are, or if you are experiencing any other type of cardiovascular emergency. 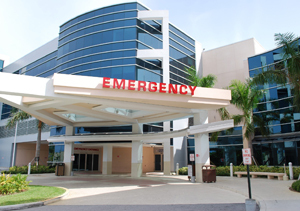 Serving the Palm Beach county region, our Emergency Department is open 24 hours a day, 7 days a week. Here you will receive safe, quality, compassionate care from a team of skilled emergency physicians and staff in a comfortable environment. If you are experiencing chest pain or think you may be having a heart attack, every second counts. The care provided to you will be timely and efficient. In fact, our Emergency Department's "Door to Balloon" time (the time recorded from your arrival to the time the cardiac specialist is ready to inflate the balloon to eliminate the blockage) is faster than the national average. Bethesda Heart Hospital works with local Emergency Medical Services and airlift services to see that you reach the hospital quickly from nearby or outlying areas. If you think that you or someone you know is having a heart attack, call 9-1-1 immediately. Chest discomfort: Most heart attacks involve discomfort in the center of the chest that lasts longer than 15 minutes, or goes away and comes back. Many people describe the discomfort as building to an uncomfortable pressure, squeezing, fullness, or burning pain; others report an unbearable crushing pain or persistent tightness in the chest. Shortness of breath: Dyspnea, or shortness of breath, can accompany feelings of chest discomfort during a heart attack, but it also can occur before any chest pain is felt. Some people may also faint during a heart attack. Other symptoms: Some people report breaking out in a cold sweat, feeling dizzy, light-headed or nauseated, or belching or vomiting. Chest pain may not accompany these symptoms. Some people experience clammy skin or skin that turns pale or blue, particularly around the mouth.